A touch of water coloring. Today I used the Zig Clean Color Real brush markers to do a bit of water coloring on my card. I am enjoying these markers because they are super easy to use and the colors are so vibrant. I stamped my image in Memento Ink first so it wouldn't smear when I colored it in! 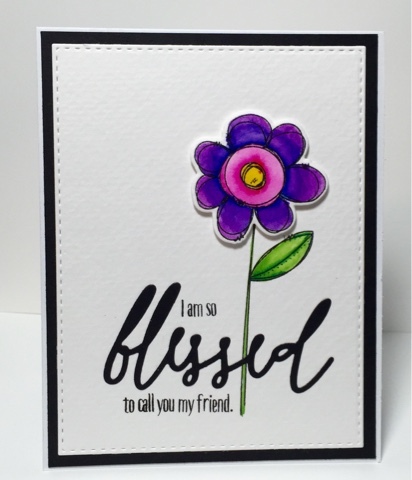 My flower and sentiment is from WPlus 9 Doddle Bugs stamp set. I hope you will give water coloring a try on your next project! Hi Everyone! 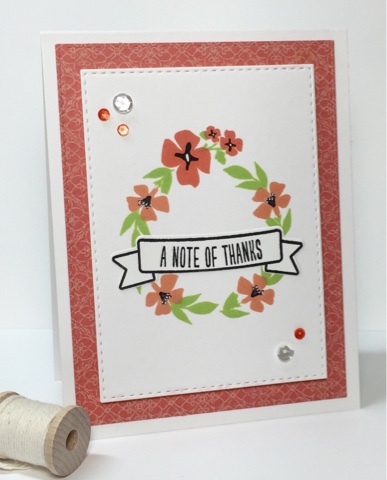 I have a clean and simple card for you today using a few pieces of pattern paper. paper and inking the edges with some distress inks to give a bit of a vintage look. I then stamped my cup and saucer and die cut them out and did a bit of paper piecing on my tea cup. I really love how it brought it to life! I popped the tea cup up on a piece of doily that had also been inked. I wanted it to look like it was sitting on a table cloth. I colored the inside of the tea cup with copics and added a touch of glitter to it. 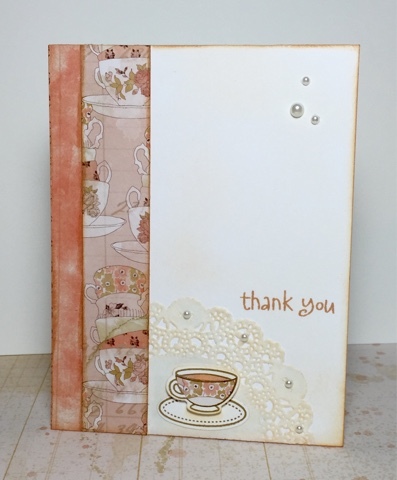 I also inked the entire card and edges and then stamped my sentiment with the same distress ink tea dye. I really love the vintage feel and the simplicity of this card. Thanks for stopping by! Ink - Tim Holtz Distress Ink and Stampin' Up! 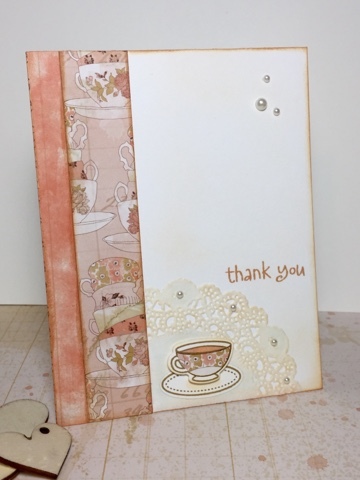 Today I made the cutest "Missing You" card with the Lawn Fawn "Fintastic Friends" stamp set and coordinating dies. I started off by stamping the tank image on the stitched banner and coloring it in with copics. 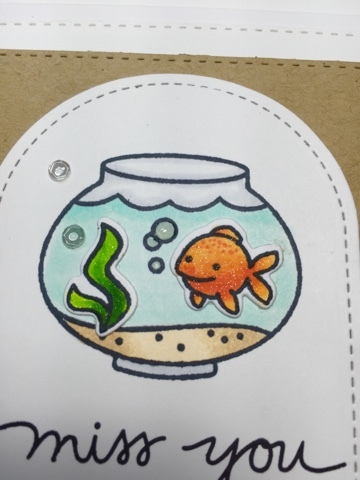 I then stamped the fish and the plant and also colored those with copics. 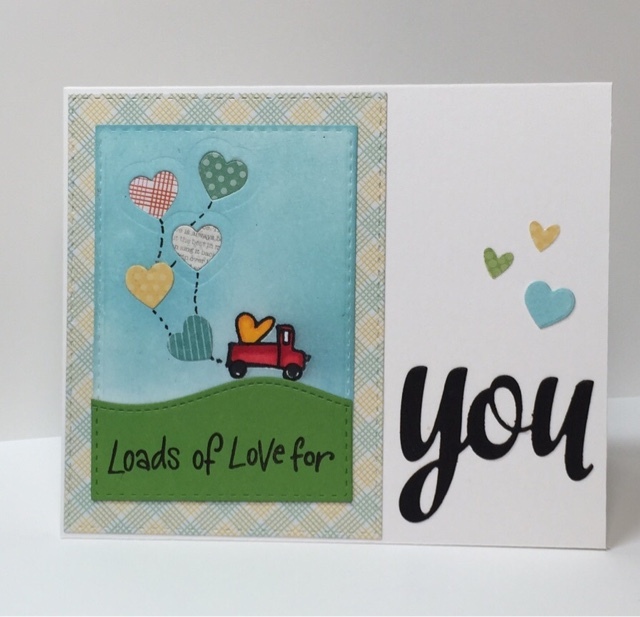 I used the dies to cut these two images out to give a little more dimension to my card. I stamped my sentiment from the Paper Smooches "Scripty Sayings" and adhered it to the stitched rectangles that are layered on my card front. To add a little more sparkle I used the Wink of Stella glitter pen, a bit of glossy accents on the bubbles and of course some Pretty Pink Posh sequins! 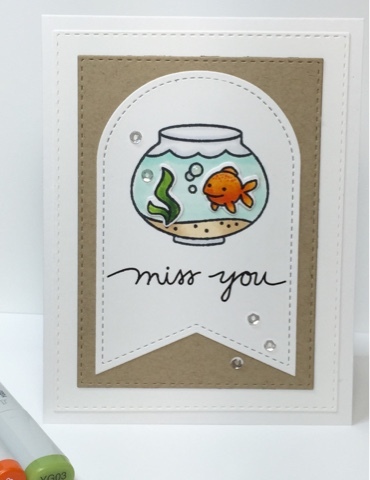 I think this card is simple but so cute. Thanks for dropping in today and Happy Stamping! Hey everyone! 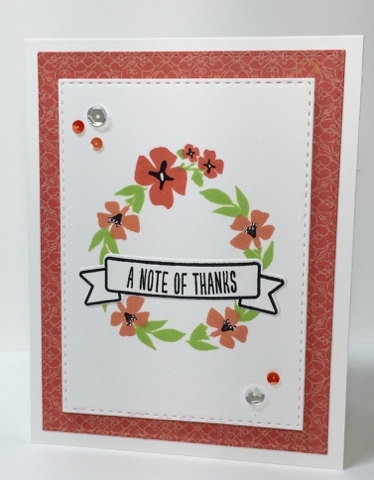 Today I made a Thank you card with one of my favorite WPlus9 stamp sets "Fresh Cut Wreaths". 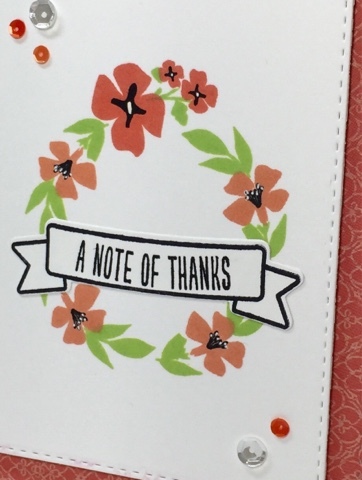 I love that this stamp set has different wreaths and flowers to layer. You can stamp all the same color or mix them up. I die cut my pattern paper and my white panel using the Simon Says Stamp Stitched Rectangle dies. For my flowers I decided to use Simon Says Stamp coral reef ink to coordinate with my pattern paper. 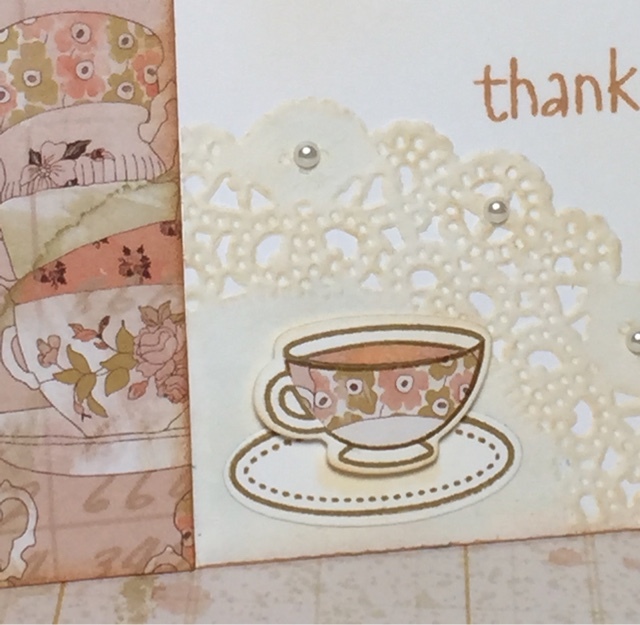 I stamped my sentiment on a banner from WPlus9 "Basic Banners" stamp set and used the die from the set to cut it out. This banner fits perfect across the wreath! For my final touch I added a few Pretty Pink Posh sequins. Who doesn't love a little sparkle, right! CS- Gina K and K&Co. Today I have an adorable card for that special man in your life! 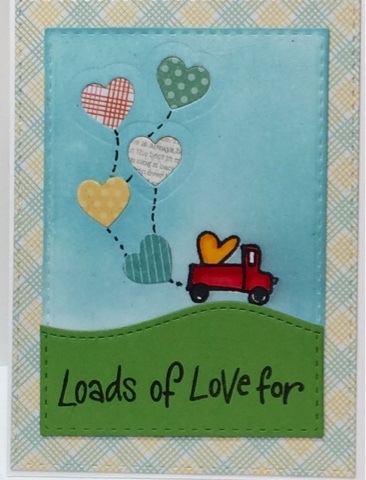 Masculine cards are sometimes hard to dream up but this cute truck from Hero Arts made the cut! I stamped the truck with memento ink and then masked it off so I could ink my background piece. I used distress inks to make a blue sky and then cut my green card stock to look like a grassy hill. popped up. To finish the card of I stamped the Loads of Love for sentiment and die cut the word YOU from the Avery Elle die. I love how this card turned out. I hope you have a great day and have been inspired to make some masculine cards. Happy Stamping.